FILE - Democratic Republic of Congo's President Joseph Kabila addresses a news conference at the State House in Kinshasa, Democratic Republic of Congo, Jan. 26, 2018. 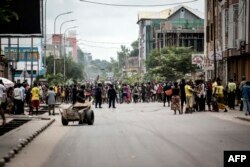 Eight in 10 Congolese have an unfavorable opinion of President Joseph Kabila — but nearly seven in 10 don't think the December vote to replace him will be fair, according to a national poll published on Friday. FILE - Protesters sing and dance during a demonstration calling for President Joseph Kabila of the Democratic Republic of the Congo to step down, in Kinshasa, Jan. 21, 2018. 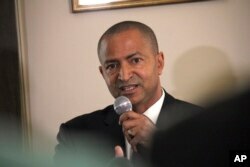 FILE - Congolese opposition leader, Moise Katumbi, speaks during a press conference at his lawyer's office in Paris, June 16, 2017.